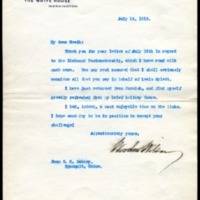 Woodrow Wilson writes to Richard Heath Dabney in regard to Lewis Aylett and the postmaster of Richmond, Virginia, position. Thank you for your letter of July 10th in regard to the Richmond Postmastership, which I have read with much care. You may rest assured that I shall seriously consider all that you say in behalf of Lewis Aylett. I have just returned from Cornish, and find myself greatly refreshed from my brief holiday there. I had, indeed, a most enjoyable time on the links. I hope some day to be in position to accept your challenge! Wilson, Woodrow, 1856-1924, “Woodrow Wilson to Richard Heath Dabney,” 1913 July 14, WWP20491, University of Virginia Woodrow Wilson Letters, Woodrow Wilson Presidential Library & Museum, Staunton, Virginia.